Every so often a character so captures the hearts and imaginations of readers that he seems to take on a life of his own long after the final page is turned. For such a character, one book is not enough—readers must know what happens next. Now Dean Koontz returns with the novel his fans have been demanding. With the emotional power and sheer storytelling artistry that are his trademarks, Koontz takes up once more the story of a unique young hero and an eccentric little town in a tale that is equal parts suspense and terror, adventure and mystery—and altogether irresistibly odd. We’re all a little odd beneath the surface. He’s the most unlikely hero you’ll ever meet—an ordinary guy with a modest job you might never look at twice. But there’s so much more to any of us than meets the eye—and that goes triple for Odd Thomas. For Odd lives always between two worlds in the small desert town of Pico Mundo, where the heroic and the harrowing are everyday events. Odd never asked to communicate with the dead—it’s something that just happened. But as the unofficial goodwill ambassador between our world and theirs, he’s got a duty to do the right thing. That’s the way Odd sees it and that’s why he’s won hearts on both sides of the divide between life and death. A childhood friend of Odd’s has disappeared. The worst is feared. But as Odd applies his unique talents to the task of finding the missing person, he discovers something worse than a dead body, encounters an enemy of exceptional cunning, and spirals into a vortex of terror. Once again Odd will stand against our worst fears. Around him will gather new allies and old, some living and some not. For in the battle to come, there can be no innocent bystanders, and every sacrifice can tip the balance between despair and hope. Whether you’re meeting Odd Thomas for the first time or he’s already an old friend, you’ll be led on an unforgettable journey through a world of terror, wonder and delight—to a revelation that can change your life. And you can have no better guide than Odd Thomas. Forever Odd was delightful to listen to. I love Dean Koontz, I've been reading his novels for more than 2 decades and I don't see myself stoping any time soon. having him on audio books makes his work even more special. The gentleman reading this series is especially good at playing all the characters in a way that makes Odd Thomas all but come to life... thank you for an enjoyable listening experience. looking forward to the next one.. Odd is lost. This is a between time. I'm not retelling the story, but giving the consequence of what happened. Odd decides that he can't stay in Pico Mundo. The story kept me pretty interested during my long commutes to/from work. Some of Koontz's books are fabulous and I hope this in no way dissuades you from this author -- but, after corridor turn after corridor turn, after up the elevator shafts and down the elevator shafts, and Odd's failings/weaknesses (that are portrayed as more prevalent than his strenghts), etc., etc., etc., the thing that stayed with me after the story was over, was that so much was left unanswered. I hope that 'Brother Odd' will answer some of the questions and not just be a new Odd story. If not -- well -- I will always enjoy 'Watchers', 'Twilight Eyes', and 'Strangers'. I just love Odd. The books have it all, mystery, suspense, comedy, horror -- you really feel for Odd Thomas. Sorry I waited so many years to read these, can't wait for the next one. Perhaps it's just Koontz I dislike, but his was too out of reality for me. This is a series written by Mr Koonz. I believe most people would like this book if you give it the chance. It starts of kinda weird and all dull but then it perks up and I ended up listening to all three of the odd books. Rent this, You'll like it if you like Elvis Presley. He plays a ghost in the whole series, but he never says a word. I enjoyed this book very much. Thought the reader's voice was perfect for the character. It was suspenseful and well-performed. Odd Thomas is a unique character, very interesting. I'm not a huge fan of returning characters but Odd Thomas is simply wonderful and endearing. 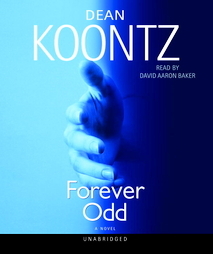 I enjoyed this story even more than the first installment from Koontz featuring Odd. There is so much humor and warmth in this character and in this story that it flows richly and before you know it, you are caught up in Odd's world of ghosts and monsters. For those that are familiar with Odd Thomas, this will solidify you as fans...for newcomers, I think you'll be instantly hooked. I LOVED Odd Thomas. That book stayed with me long after I had listened to it. Unfortunately, this follow up was not even close to the original. It was OK in every way - not great, not bad. I still look forward to listening to the next book in the series, but my expectations are much lower.